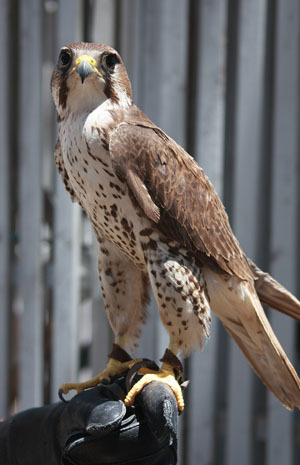 Welcome Sunny /Hawks Aloft Inc.
We have a new addition to our Avian Staff: a male Prairie Falcon. He came to us from southern New Mexico with a badly damaged wingtip. The wingtip was hanging from a thread and had to be amputated at the last digit. We are not sure how he was injured, but he was discovered by a pair of young hikers in the desert, one of whom was a vet tech and carried him to safety in a jacket. Gena Esposito, our former Education & Outreach Coordinator was given the honor of naming our new bird and for several reasons she chose “The Sundance Kid”. For those of you who do not know who this character is, he was a real person made famous by the 1969 film “Butch Cassidy and the Sundance Kid”. This film is based on the true story of two outlaws running from the law through the Wild West. 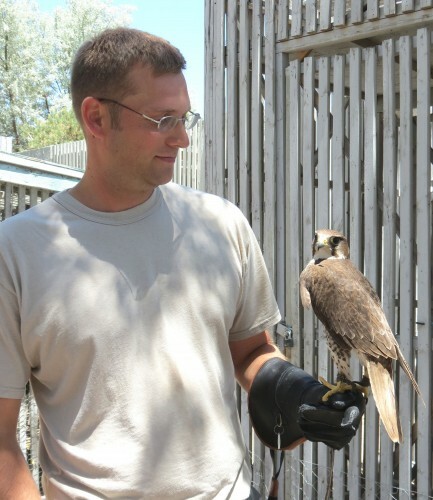 Prairie Falcons are found exclusively in the arid American West and are reclusive birds that rarely choose to live around humans; kind of like Wild West bandits on the run from the law. In the 1969 film, The Sundance Kid is played by Robert Redford who sports a classic mustache (the real Sundance Kid also had a nice moustache). This brings us to reason number two for our new bird’s name: one of the identifying marks of Prairie Falcons is their dark brown moustache stripe. These stripes are really the long malar stripes that all falcons sport to some degree to help protect their eyes from the sun. We plan to call the bird “Sunny” for short. This name also has a reason: his cere (top part of his beak) and feet are a bright yellow color. This may fade over time, however, due to changes in his diet. Sunny’s initial training was done under the excellent hands of Lisa Morgan. Look for Sunny to begin making brief appearances at programs over the next few months. For now Gail is bringing him to the office regularly to get him used to being around people. For some reason he still thinks he’s a wild bird. We also thank volunteers, Ty Sutherland and Bryan Sohl, who responded to our request for assistance in spiffing up the Falcon Flight by removing a dividing wall so that Isis, our Peregrine Falcon, and Sunny could share a much larger space. 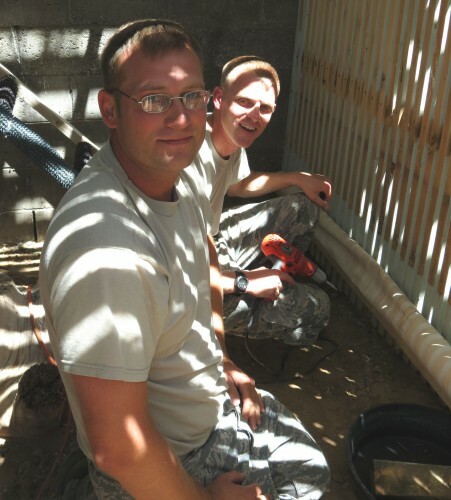 They arrived on Friday and made short work of the project! Now, Sunny and Isis have really spacious digs! Thanks so much to Ty and Bryan, and all of our terrific volunteers!